Our last day at Walt Disney World was a very chilled out one, which was just what the doctor ordered after such a brilliantly busy itinerary during the course of our stay. We had a late a breakfast at our hotel (I ate ridiculous amounts of bacon - it just tastes so much better in America!) and then we decided we'd really like to spend our last few hours soaking up the Floridian sunshine by the pool. I touched on the subject of the pool at Disney's Animal Kingdom Lodge in my original post about our hotel. It was just SO GOOD; definitely the best hotel pool I've ever come across since holidaying with the kids. So much thought had gone into it's design which meant it was perfectly family friendly. From the vast amounts of shade courtesy of the palm trees, to the sloping entry to the big pool (and the little splash pool!) and not forgetting the number of life guards on duty at any one time. Both Daisy and Evie (the daredevil!) had equal amounts of fun on the slide as they did frolicking about in the shallow waters. And I loved it because I really felt I could relax. 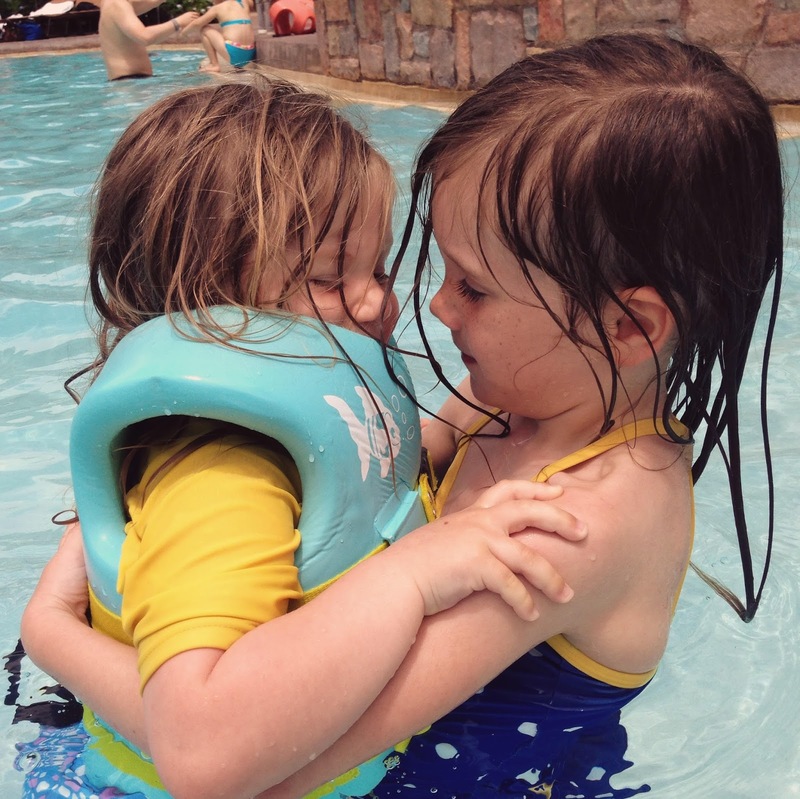 This holiday was the first time I had ever taken both girls to the pool on my own and it was fine - better than fine even! - we had a blast! After one last trip to the gift store, and some postcard writing in the lobby, the time came to check out and start our journey back home. We'd had the trip of a lifetime and I was so lucky to have been given the opportunity to take the girls on it. Walt Disney World really is the ultimate family holiday destination. The girls were excited from the moment they woke each day. They stayed up late and didn't nap, and weren't in the least bit grumpy or overtired. I think they just wanted to make sure that they didn't miss a thing - and who can blame them! They loved the character meet & greets, the rides, the shows and the pools - and I loved watching their reactions to every new experience. There is just so much to see and do, and Disney's attention to detail (I'm talking everything, from their customer service to their resort decor) is second to none and really makes a dream holiday that extra bit special. - our hotel. I loved everything about it, but I loved those big heavenly beds and black out curtains the most! - our magic bands, and in particular the Memory Maker facility. At last, a holiday where we have proof that I was actually there! - the entertainment. NO trip to Disney is complete without watching the parade and at least one of the night time spectaculars. I come over all teary reminiscing about them now that we're back home. Breathtaking. We honestly had the most wonderful trip and made some truly magical memories. Thanks so much to Disney for inviting us along! Seven nights at Walt Disney World Resort in Florida with Virgin Holidays, including scheduled flights from London Gatwick direct to Orlando, room only accommodation at the 5V Disney's Animal Kingdom Lodge and car hire starts from £1,889 per adult and £779 per child. Price is per person based on 2 adults and 2 children travelling and sharing a standard room and includes all applicable taxes and fuel surcharges which are subject to change. Price is based on a departure on August 04 2015. Start your holiday before you’ve even taken off in the v-room at Gatwick Airport… adults £24.50, kids from £14. Virgin Holidays is a member of ABTA and is ATOL protected. Virgin Holidays is a member of ABTA and is ATOL protected. To book: www.virginholidays.co.uk, 0844 557 3859 or visit one of our 126 stores located in Debenhams and House of Fraser stores nationwide. Disney’s 7-day Ultimate Ticket - £319 Adult ticket and £299 Child ticket (aged 3-9). Enjoy Disney’s 7-Day and 14-Day Ultimate Ticket deal and experience all that is on offer – there’s something for everyone. Come and go as you please to all SIX Parks at one incredible price. Only available to purchase in the UK and Ireland, buying before you fly also helps you budget in advance and plan your holiday more effectively plus for every 2016 Adult Ultimate Ticket pre-purchased, Memory Maker is included FREE (usually $199 on the gate).